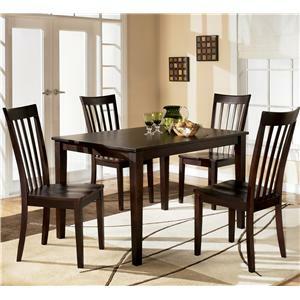 Add simple yet sophisticated style to your dining area with this 5-piece set. 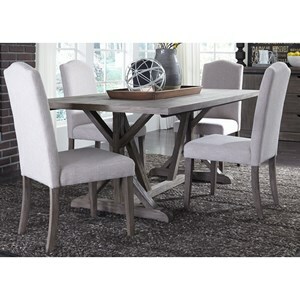 The 72" round table is perfect for large dining spaces, and entertaining guests. 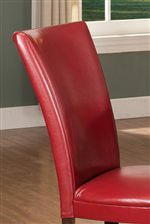 Two deep red and two dark brown Parsons side chairs feature high contoured backrests and padded seat cushions for smooth comfort. Finished in a rich dark brown hue for a sleek, contemporary look with a frosted glass 22" round lazy susan. The Hartford 5-Piece Contemporary 72" Round Table & Parsons Chair Set by Steve Silver at Van Hill Furniture in the Grand Rapids, Holland, Zeeland area. Product availability may vary. Contact us for the most current availability on this product. The Hartford collection is a great option if you are looking for Contemporary furniture in the Grand Rapids, Holland, Zeeland area. 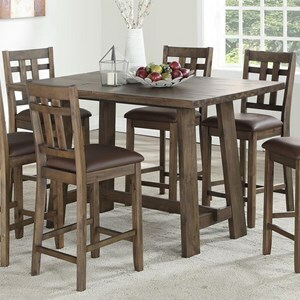 Browse other items in the Hartford collection from Van Hill Furniture in the Grand Rapids, Holland, Zeeland area.